Low back ache is the single most common cause of work absenteeism. Cross-sectional population survey shows, a lifetime prevalence of 60% approximately . Alkaptanuria is one of the few original “ inborn metabolic disorder” described, hitherto. It is characterized by a triad of the homogentisic aciduria, arthritis and ochronosis. The incidence is about 1 in 250,000 births . Irony is, lumbar disc disease is a common clinical occurrence in alkaptonuria, but alkaptonuria is a rare cause for low back ache. A patient with alkaptonuria without ochronotic signs is also rarely seen. In asymptomatic patients of alkaptonuria or ochronosis, early detection of the disease is important to treat involvement of other systems (e.g., cardiovascular and urinary). Although lumbar disc disease is a common clinical occurrence in alkaptonuria, lumbar disc surgery is rarely needed in this disease . A 38-year-old male, embroidery worker by occupation, presented with a history of low back ache and stiffness with generalized weakness for the last 6 years. Patient had been treated on and off conservatively in past, several times for back-ache. The pain was insidious in onset and progressive in nature, increased on exertion and relieved with rest. There was no history of pain radiating or pain associated with coughing and sneezing. No history of rest pain or night pains. There was no history suggestive of sero-negative spondylo-arthropathy or rheumatoid arthritis. There was no history of any neurological claudication, tingling or numbness in lower limbs. Upper limbs were normal. Spine examination revealed a flexible scoliosis to the right side in the lumbar spine with restricted lateral flexion on the left side. There was tenderness over lumbar vertebrae, paraspinal muscle spasm with restricted movements. The straight leg raise test and Faber’s test were negative. There were no neurological deficits. Examination of the rest of the spine was normal. The most important history was given to us by patient’s mother mentioning dark colored staining of patient’s undergarments in infancy. Later on further enquiry it was found that patient’s toilet had persistent dark colored stains after several hours post-micturation. The patient was born out of non-consanguineous marriage, full term normal delivery with no developmental delay. Patient had no history of any addictions. X-rays revealed obliteration of lumbar lordosis, disc space narrowing, prominent osteophytes in the vertebral bodies and a right-sided scoliosis at lumbar level. Prominent degenerative changes were evident in the lumbar spine, and the vacuum phenomenon occurred in almost all the lumbar disc spaces. X-ray of rest of the spine and adjacent joints were normal. As X-ray revealed prominent bony lesions and patient had no neurological signs or symptoms, a computed tomographic examination showed protrusions, vacuum phenomenon, osteophytes, and Schmorl nodules in the L3-L4, L4-L5, and L50S1 discs. Ophthalmic examination, skin examination, ultrasonography abdo-pelvis and echocardiography were normal confirming no other systemic involvement. In alkaptonuria patients, plasma levels of homogentisic acid (HGA) are on average 6.6 µg/ml; normally HGA levels are undetectable. Urinary HGA levels are increased 300 fold in alkaptonuria patients, between 0.4 and 12.4 g/day (on average 3.12 mmol HGA/mmol of creatinine) . All laboratory investigation was normal, but for HGA excretion in the urine which was 32.9 mmol/mol creatinine. Plasma level of HGA was 8 µg/ml. Both were more than their normal level. Following biochemical tests were performed to confirm the diagnosis of alkaptonuria1: 1. 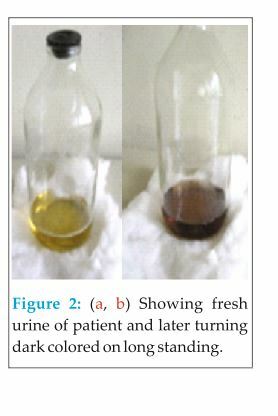 Urine turned black on exposure to air for many hours due to oxidation, 2. Ferric chloride test: transient green color formed 3. Ammoniacal silver nitrate test: black precipitate of silver formed 4. Benedicts test: gave dark supernatant, initial greenish brown precipitate followed by a yellow precipitate of cuprous oxide on standing 5. BJutanol test: Pinkish brown color developed. Finally, diagnosis of alkaptonuria was concluded. Treatment and follow-up: Patient was treated symptomatically with complete rest, analgesics and physiotherapy vitamin C 500 mg twice daily was given along with vitamin C rich diets. No specific diet restriction of tyrosine or phenylalanine was recommended as patient responded to vitamin C. The patient responded well and returned back to normal day to day activities. The patient is under follow-up now 1 year since commencement of treatment with no recurrence of back-ache nor any ochronotic features. Treatment is still continued. Alkaptonuria is an autosomal recessive hereditary disease characterized by the absence of HGA oxidase, an enzyme in the metabolic pathway of aromatic amino acids, in the liver and kidneys and with subsequent excretion of HGA in urine. 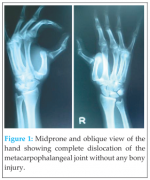 HGA on oxidation and polymerization produces a black pigment which has high affinity for the hyaline cartilage of major peripheral joints, intervetebral discs and gets deposited in all connective tissues called ochronosis. There is no direct correlation between the amount of pigmentation and the severity of the disease. Most of the patients present in their late second or third decade with either simple alkaptonuria or alkaptonuric ochronosis prognosing to alkaptonuric arthropathy [3,5]. Our patient presented in his late third decade with no systemic manifestations. Alkaptonuria as a systemic disorder may have other systemic involvement such as cardiac valvular diseases or nephrolithiasis other than connective tissue and joint involvement. Alkaptonuria frequently occurs in association with lumbar disc disease. The incidence of low back ache and lumbar strain alone without other signs and of alkaptonuria and ochronosis is very low . In patients with no other signs of alkaptonuria or ochronosis, early detection of the disease is important to treat involvement of other systems early in its course. Alkaptonuria is a rare disease whose incidence is approximately 1:1 million individuals. The disease was first described by Scribonius in 1584 in a child whose urine was black. Thereafter Boedeker and Wirchow reported a few cases in 1859 and 1866, respectively. Albrecht and Zdareck called attention to the association between alkaptonuria and ochronosis in 1902. Thanks for the works of Scribonius, Boedeker, Wirchow, Albrecht and Zdareck, which have thrown light over the evolution and better understanding of the pathophysiology of the disease. The common most symptoms of joint and connective tissue involvement among alkaptonurics is back stiffness, low back pain and sciatica rarely. In alkaptonuric spondylosis, degenerative changes may be seen along the whole of the spine; however, the most prominent involvement is in the lumbar region [6,7]. Our patient too had presented with chronic low back pain without any neurological involvement. In our case, there was no discoloration in the cornea, pinnas or skin. 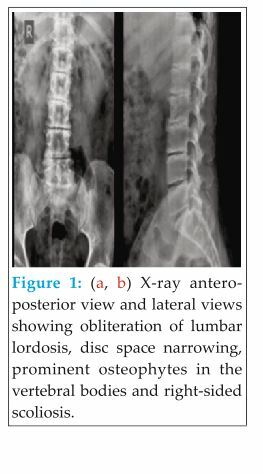 In the early phase of alkaptonuric spondylosis, lumbar lordosis flattens, and thoracic kyphosis becomes prominent mimicking ankylosing spondylitis with no syndesmosis, annular ossification, or bamboo sign and no enthesopathy. Progressive degeneration and calcification of the nucleus pulposus causes a characteristic radiographic finding described by Pomeranz et al. As universal calcification of the intervertebral discs. Calcification of the discs appeared as elliptical opaque wafers in the intervertebral discs. Vacuum phenomenon in the discs has often been reported. Sharma et al. Reported if “vacuum phenomenon“ is evident in more than one disc space in the patients during the third, fourth and fifth decades, the diagnosis of alkaptonuria must be considered .Surgery was offered for lumbar disc herniations related to alkaptonuric spondylosis if it was necessary or if neurological symptoms were present. Furthermore in patients with alkaptonuria accelerated arthritis of major joints of the body is present mainly involving load-bearing joints. Arthroplasty serves as an appropriate option once the joint has completely worn out [3,5,10]. Kusakabe et al. reported a case in which there were no ocular or cutaneous signs. In that patient, who had a medullary compression syndrome related to atlantoaxial arthropathy, an operation was performed for stabilization. Emel et al. Reported two cases who presented with no cutaneous and clinical features of alkaptanuria and ochronosis expect for low back- ache. Intraoperatively there were pigmented discs that later on biopsy study revealed onchonosis. Those patients later showed positive laboratory signs suggestive for alkaptonuria. No treatment modality has been unequivocally proven to reduce or reverse the complications of alkaptonuria. Therapeutic approach includes mega dose of vitamin C for the degradation of HGA. Diet restricted in phenyl alanine, tyrosine have not yielded any significant positive results. However, reversing the primary defect is not possible by the available treatment options. Nitisinone, a triketone herbicide has shown to reduce the excretion of HGA by inhibiting the enzyme 4-hydroxy phenyl pyruvate dioxygenase that is responsible for the synthesis of HGA. But, long-term trials are needed to prove the safety profile and efficacy of this compound in the treatment of alkaptonuria. Although, dietary restriction may be effective in children, it has not shown any benefits in adults [4,11]. Even in our case we treated patient with large doses of ascorbic acid (vitamin C) and dietary restriction of tyrosine and phenylalanine. Initially, patient was given bed rest for 2 weeks and then gradually with back and abdominal strengthening exercises for 6 months. Alkaptonuria is a very rare disease. Though low back ache is known manifestation of alkaptonuria, but occurrence of same in the absence of ochronosis is much rarer. One must be aware regarding pathophysiology, manifestation and treatment options of alkaptonuria. Early diagnosis and high index of suspicion are advantageous as symptomatic treatment of the alkaptonuria can be initiated, and evaluation of other systemic organs can be done in early stages itself. Also in patient with alkaptonuria accelerated arthritis of major joints of the body, mainly load bearing joints is evident and since no specific treatment modality is available arthroplasty serves as an appropriate solution. Though alkaptonuria is a very rare disease and the occurrence of low back-ache in absence of ochronosis is much rarer. One must be aware of this inborn error of metabolism. Early diagnosis though being “diagnosis of exclusion” for low back-ache, high index of suspicion is advantageous as symptomatic treatment of the alkaptonuria can be initiated and evaluation of other systemic organs can be done in early stages itself. 1. Waxman R, Tennant A, Helliwell P. A prospective follow-up study of low back pain in the community. Spine (Phila Pa 1976) 2000;25:2085-90. 2. Garrod AE. The incidence of alkaptonuria: A study in chemical individuality. Lancet 1902;11:1616-20. 3. Emel E, Karagöz F, Aydín IH, Hacísalihoglu S, Seyithanoglu MH. Alkaptonuria with lumbar disc herniation: A report of two cases. Spine (Phila Pa 1976) 2000;25:2141-4. 4. Phornphutkul C, Introne WJ, Perry MB, Bernardini I, Murphey MD, Fitzpatrick DL, et al. Natural history of alkaptonuria. N Engl J Med 2002;347:2111-21. 5. Kusakabe N, Tsuzuki N, Sonada M. Compression of the cervical cord due to alcaptonuric arthropathy of the atlanto-axial joint. A case report. J Bone Joint Surg Am 1995;77:274-7. 6. McCollum DE, Odom GL. Alkaptonuria, ochronosis, and low-back pain. A case report. J Bone Joint Surg Am 1965;47:1389-92. 7. Millea TP, Segal LS, Liss RG, Stauffer ES. Spine fracture in ochronosis. Report of a case. Clin Orthop Relat Res 1992;208-11. 8. Pomeranz MM, Friedman LJ, Tunick IS. Roentgen findings in alkaptonuric ochronosis. Radiology 1941;37:295-302. 9. Sharma RR, Ravi R, Bhama BA, Mathad NV, Mazarelo TB, Vaidya MM, et al. Cervico-medullary compression secondary to ochronotic arthritis affecting cranio-vertebral joints syndesmo-dental ochronotic arthritis. J Postgrad Med 1988;34:253-7. 10. 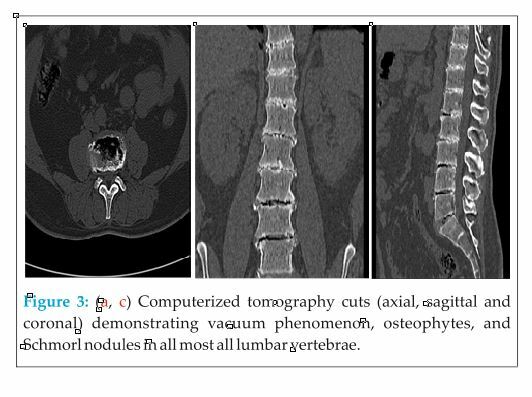 Feild JR, Higley GB Sr, Desaussure RL Jr. Ochronosis with ruptured lumbar disc: case report. J Neurosurg 1963;20:348-51. 11. John SS, Padhan P, Mathews JV, David S. Acute anterior uveitis as the initial presentation of alkaptonuria. J Postgrad Med 2009;55:35-7..